LONG ARMED LOBSTER - JURASSIC SOLNHOFEN GERMANY. 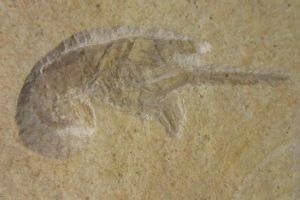 Squared slab of Lithographic limestone showing a complete long armed lobster. Nice detail under magnification. From the world famous fossil beds around Solnhofen in southern Bavaria. Jurassic, Upper Kimmeridgian, Tithonian, Solnhofener Plattenkalk. Matrix : 11 x 11 x 1 cm. Lobster : 7.9 cm. across.